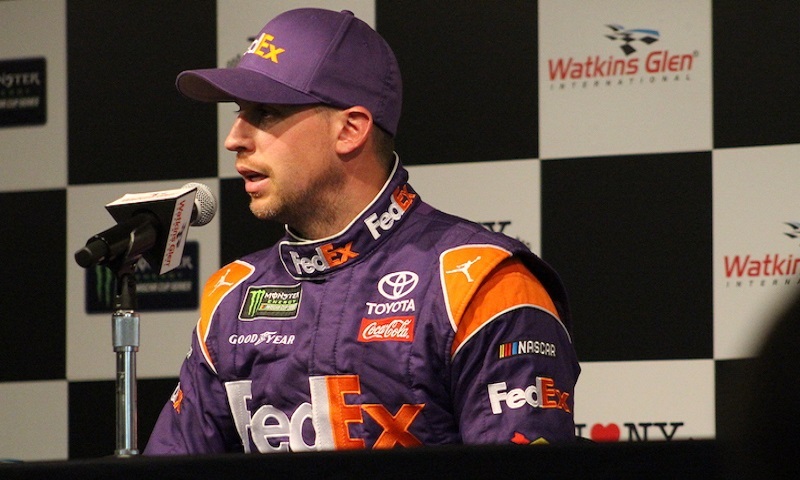 WATKINS GLEN, N.Y. — Denny Hamlin is racing at Watkins Glen Int’l this weekend with the Monster Energy NASCAR Cup Series, but his thoughts are no doubt with his family at home all the while. Hamlin’s longtime girlfriend, Jordan Fish, announced earlier this season at the Daytona 500 that the couple were expecting their second baby in August. 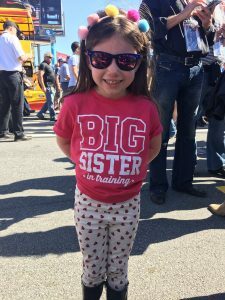 The announcement back in February was captured on the starting grid, as Hamlin’s four-year-old daughter Taylor displayed a shirt showing her excitement. With the situation potentially changing at a moment’s notice, Regan Smith is on standby for Joe Gibbs Racing this weekend, should Hamlin have to leave the track for the birth. Hamlin spoke to the media on Saturday morning at Watkins Glen and outlined his team’s plans that have been put into place, in the event that Jordan were to go into labor this weekend. The question of course would be, if Hamlin gets the call before qualifying or the race on Sunday, what would he do and what ramifications would have to be considered in making that decision? 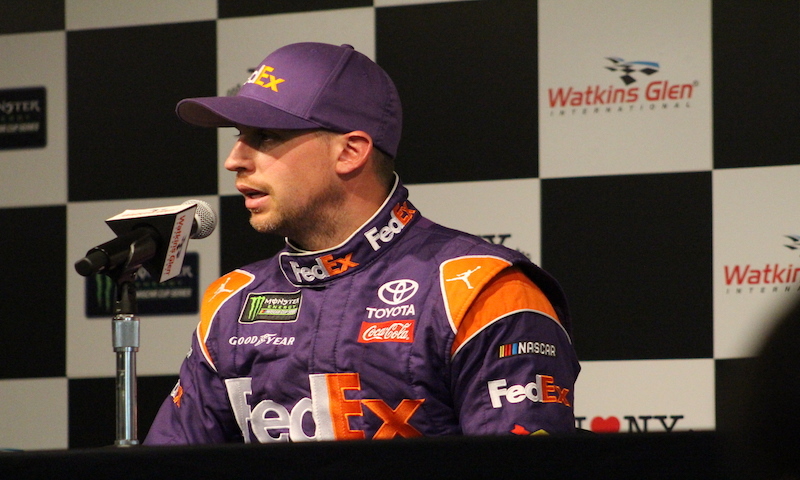 One reporter asked Hamlin if his team or Joe Gibbs Racing had gone to NASCAR to discuss possible scenarios and what would happen if Hamlin had to miss qualifying and/or the I Love New York 355 at The Glen? Would NASCAR offer Hamlin a playoff waiver, allowing him to attend the birth of their second child, considering that he has won a race this season and is virtually locked into the 16-driver field? Hamlin did tell reporters that his jet is on standby and ready to leave at a moment’s notice. If he were to get the call to leave, Hamlin would need to jump into the rental car and make the 15 to 20-minute drive to the Elmira Regional Airport, located in Big Flats, N.Y., to make the short flight back to the Charlotte area. Smith, dubbed NASCAR’s ‘Super Sub,’ is on standby … and this would not be the first time that Smith has had to sub for a Monster Energy NASCAR Cup Series driver at Watkins Glen. He did so back in 2014, when Tony Stewart sat out on race day after a sprint car accident at Canandaigua Motorsports Park the previous night that claimed the life of Kevin Ward Jr.
That day, Smith was called in as Stewart’s replacement. The only NASCAR race held in New York state is also just a short drive from Smith’s hometown of Cato, N.Y. — just outside of the city of Syracuse. 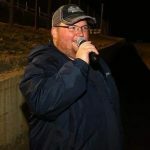 Ovens has spent his lifetime in the sport of dirt track racing, growing up in the garages of the Kerrick and Ovens families. He spent 11 years behind the wheel between go-karts and four-cylinder mini stocks, which brings a unique perspective to his dirt track editorials.